Liu Guan Zhang has no restrictions on how many times he can attack during his turn. Every heart card in Liu Guan Zhang's hand is an attack. Whenever Liu Guan Zhang uses one of these attacks, there are no range restrictions. King Ability: If Liu Guan Zhang needs to use an attack, he can ask any member of Shu to provide him one. "Roar" is the same power as the original Zhang Fei. "War God" is the same power as God Guan Yu. "Fierce General" is the king ability of Liu Bei. Liu Guan Zhang can use a weapon ability each and every time he attacks. "War God" is enforced. 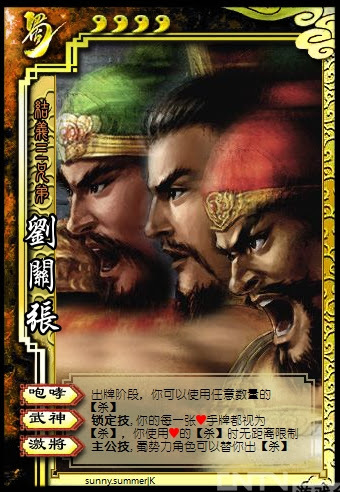 All of Liu Guan Zhang's heart cards are always Attacks and they cannot be used for their original function. If Liu Guan Zhang uses a Fire Attack that is a heart, it is change to a standard Attack. When a character from Shu gives Liu Guan Zhang an Attack via "Fierce General," the action is considered to be taken on the part of Liu Guan Zhang. Therefore, Liu Guan Zhang's weapon takes effect and Liu Guan Zhang suffers any consequences for damaging the target. Liu Guan Zhang can use "Fierce General" when he wants to attack another player, when participating in a Duel, and when responding to Barbarians. When players give an Attack they can use their abilities to help them generate the card. Guan Yu can use a red card to give to Liu Guan Zhang, then Liu Guan Zhang uses it as an Attack. A member of Shu can also use the Serpent Spear to generate cards as well. Powers that take effect after the Attack is played do not take effect, e.g. Huang Zhong's power "Strong Bow" cannot be used through "Fierce General."